DPS troopers rescued a loose dog that was running on Interstate 10 near 75th Avenue Monday morning. 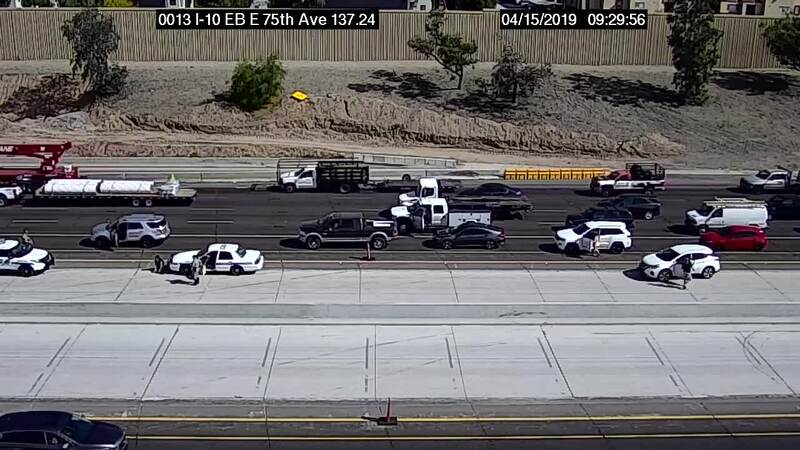 PHOENIX — Troopers were able to safely grab a dog that was running loose on I-10 in the West Valley Monday morning. Video from Arizona Department of Transportation cameras showed several troopers keeping traffic at bay while others attempted to grab the dog. Watch video of the dog's adventure in the player above. The dog was running in the westbound lanes of traffic and generally stuck to the shoulder to the left of the HOV lane. After running to nearly 75th Avenue, the dog reversed course and started running against traffic. Troopers were able to get ahold of the animal shortly thereafter. The dog will be taken to Maricopa County Animal Care and Control for evaluation and treatment, DPS said.